the graduating neices, a photo by Southworth Sailor on Flickr. Kelsea, Bria and Marika all finished their respective course work at Calvary Chapel Bible School and Canyonview Equestrian College. So this weekend there was a celebration bash in Greenwood. Each girl had a pavilion in honor of their interests. 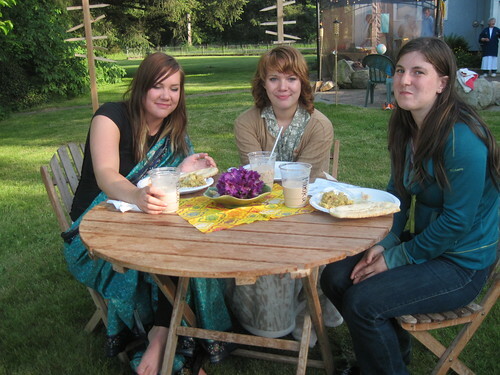 Kelsea had an India tent, Bria an Irish Hobbit house and Marika an Italian tent. There was a meal honoring each girl and their country of passion: Italian, Irish and Indian, for guests to enjoy. We were thankful for yet another rainless weekend (a notable dry Memorial Day weekend) Congratulations to all three girls on their accomplishments.